Every Christmas Eve, the levee along the Mississippi River in St. James Parish, Louisiana is transformed into a necklace of blazing bonfires. It seems as if everyone in the towns of Gramercy, Lutcher and Pauline, which are located about midway between Baton Rouge and New Orleans, has participated in building one of the log structures that are set alight at exactly seven o’clock in the evening, often with accompanying fireworks. The homes along on the road that parallels the river are bustling with parties for family and friends, while food trucks and small vendors sell food, fireworks and glow sticks. Every year, Johnette’s friend Keri Walker Tramonte has invited her to the bonfires, but it never has worked out for us to attend—either we were away, the weather was bad, or some other reason prevented us going. This year, we were in New Orleans for Christmas, and the weather was perfect. We arrived at about 3:30 in the afternoon, in time to walk a mile or so along the crest of the levee. Children were “sledding” on the grass, down the outside slope of the levee, while teenagers rode four-wheelers up and down the concrete inner side, looking as if they might tip over at any minute. Every couple of hundred feet, a family or group of friends had built a bonfire structure, and many were adding final touches. 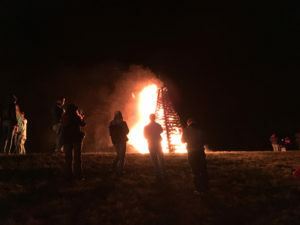 Usually, the bonfires are tepee-shaped, with a center pole and four side braces that support stacked log walls. The entire structures, which can be as high as twenty or twenty-five feet tall, are filled with more wood—large logs and smaller debris. Some structures were loaded with fireworks, or draped with red paper-covered strings of firecrackers. Keri told us that her work had started many weeks earlier, when she and her co-builders found and cut the trees for her bonfire. “It’s hard to find long, straight poles, but after that, it’s easy to find the wood you need.” The timber then has to be moved to the levee, where a chainsaw and strong muscles are required to complete the work. The tradition of bonfire making is usually the task of the men in the family. However, in Keri’s family, it is the women who build the structure. Keri decorated her bonfire with a colored plywood cutout of the famous Blue Dog, painted so often by artist George Rodrigue. Almost every family walking along that part of the levee wanted to stop to take their photo with the blue dog. Keri, her husband Andy and their two sons live directly across the road from the levee and her bonfire. Their yard was decorated with hanging lights, a small fire pit and two long tables filled with food, including a delicious gumbo and potato salad. Everyone made us feel right at home. We sat and listened to stories about the bonfires—this year, someone had constructed a snapping turtle, complete with a moving head—before climbing back onto to the levee to witness a sunset that seemed to have made to order, with its orange, red and purple colors. We returned to our home base for a bowl of hot gumbo and waited for the sun to set. Then, the action shifted to the levee. We climbed up to Keri’s bonfire and removed the Blue Dog, while neighboring groups began to set off an impressive array of fireworks. Finally, in unison, each family or team ignited its work. The fires started slowly, but very soon, especially if the construction of the tower is right, each triangular sculpture is entirely aglow. Looking up and down the levee, we now could see dozens or fires blazing. The road was jammed with the slow-moving cars of people who had traveled to see the spectacle. Fireworks were popping and sparks were flying as the flames seemed to reach out across the black river. That night, Papa Noel found his way along the river well-lighted, as he prepared to deliver gifts to the children of St. James Parish. The warmth of the community that had brought this tradition to life for another year was one of the most palpable expressions of good cheer that anyone could imagine.